Given all the slobbering on here recently over the Zips coach I'm really not sure for which team some BAers will really be rooting. Personally I'd like to see Coach Phillips absolutely rout the other guy's team on Saturday while we celebrate The Roundhouse on Richland. Go Bobcats. Me too, Grover! Beat the damn traitor to our cause. Let�s do �em like we did Marshall! Given that it is early February, this one should be a cake walk. If we meet again in March though, you can bet we are toast. As simple as this is, I think it's pretty much going to determine our wins and losses the entire year: can we make shots? I think we've shown that, defensively, we can play well enough to beat most teams in the MAC (probably excluding Buffalo, because they are Buffalo). Can we make enough perimeter shots to win? Can we make just an average amount of free throws? Looking at our MAC losses, we've been "in" about all of them and just making a few shots could have flipped them to W's. NIU both times, we held KSU to 66 and the game was close throughout but couldn't score, Toledo and BG weren't close. We could just as easily be 5-3 as 3-5 if we could make a few shots. I know, that's basketball, whoever makes more shots usually wins. We've averaged 58.6 points in our MAC losses. We've averaged 76.3 points in our MAC wins. It stands to reason if we can hit Lava Cake country, we have a pretty good chance to win. Looking foward to "50 Years in the Convo" this weekend. Lots of time spent on that floor. Won some, lost some. Hope to have a quick visit with Coach G and Dustin to catch up with how they are doing. Go Bobcats! The guys really need to have their heads in the game. A big contributor to our losses is sloppy play. Seems like in every loss there are two or three passes to nobody in particular that wind up in the stands, in the bench or hitting a ref. Happened a couple times again at Dekalb. It's more than just an errant pass. It's not recognizing where teammates are. Sibs weekend right? And the 50 year Convo anniversary? Get that place jumpin! Is nobody gonna talk about the throwback uniforms for the game???? Those are pretty cool. When they first announced this,I figured they'd come out with a replica jersey or tee. Guess nobody thought it would sell. I still have a t with the original mascot wearing a beanie that I got about 30 years ago. I think that would sell big. Per the usual, and unsurprisingly - opportunity missed. There should have been a 50th anniversary season t-shirt (or t-shirts) made and available for sale way back in early December, and sold throughout the season. Anything vintage is better than the Attack Cat. Homage briefly sold a women's tee with this version on it. It's probably my favorite version of the Bobcat, and would love something with it on it. Actually, the AttackCat is a stylized version of a decal that I had on my VW beetle back in the 1960s. 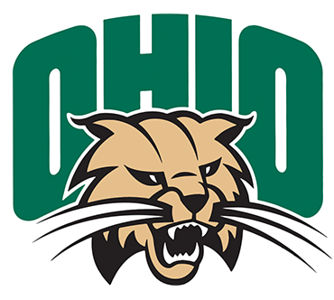 That decal featured the arched OHIO and a slightly more realistic looking cat with its mouth open and its tongue visible. I wish I still had a copy of it. I would post it. So, the "vintage" and the contemporary aren't that far apart. As usual, the BA historian comes through! Anything from Homage has cool vintage Ohio logos. Vegas opens this game as pick-em. Throwbacks look pretty cool (from what the video actually showed - seems like they purposely tried to only show teasers to keep it "hidden" until game day though). Would have absolutely loved to have the option to buy some throwback gear. How the heck did they drop the ball on that one? Is this department run out of somebody's mother's basement? And ugh @ the "attack kitten". That thing is epically awful. Bring back the paw and bring it back yesterday. I cringe every time I see that dumb thing. Looks like something from the local middle school. That bobcat knows where you can get some cocaine. Most of you all in general are spot on. There are few of us that have seen all facets of The Convo.. The Who, The Boss, Springsteen, Beach Boys etc. I went to my first Ohio Mens basketball game when I was two weeks old Feb.6 1979, I have seen some great H.S. tournament games. Watching Geno grow up. oops kind of, BG game in 84' over 13,000.. OSU in the NIT. So many memories, going to games and seeing people that you chat with. the comradorie of other Bobcats in the atmosphere .. walking in and the smell of the popcorn. Bobcat buddies, "when it was legal" Green and White, PAWS, etc. It would be neat if anyone else feels comfortable sharing memories. The Convo 50th. hits home for this guy.. imagine if hockey were to play there too. it was built to. that big entrance for Zamboni entrance.. Go Bobcats! it should be a fun Saturday. Most of you all in general are spot on. There are few of us that have seen all facets of The Convo.. The Who, The Boss, Springsteen, Beach Boys etc. I went to my first Ohio Mens basketball game when I was two weeks old Feb.6 1979, I have seen some great H.S. tournament games. Watching Geno grow up. oops kind of, BG game in 84' over 13,000.. OSU in the NIT. So many memories, going to games and seeing people that you chat with. the comradorie of other Bobcats in the atmosphere .. walking in and the smell of the popcorn. Bobcat buddies, Green and White, PAWS, etc. It would be neat if anyone else feels comfortable sharing memories. The Convo 50th. hits home for this guy.. imagine if hockey were to play there too. it was built to. that big entrance for Zamboni entrance.. Go Bobcats! it should be a fun Saturday.